After we got official word from Google’s own Eric Schmidt, that Android’s next iteration, 4.0, codename Ice Cream Sandwich, is coming in October or November, speculation on the first handset to run it, is running high. All bets are that Samsung is the lucky Nexus manufacturer this time around and the name of handset is Nexus Prime — Nexus Galaxy wouldn’t sound right, now would it? 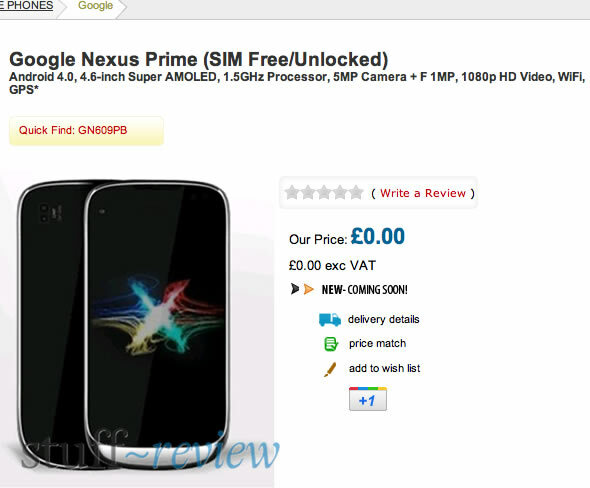 The latest leak comes from an unlikely source; a UK retailer just posted a webpage for the Nexus Prime listing a number of specs which we’ve already seen rumored for the handset. The site lists: Android 4.0, 4.6-inch Super AMOLED, 1.5GHz Processor, 5MP Camera + F 1MP, 1080p HD Video, WiFi, GPS. This could be a solid leak or just the attempt of a retailer to drive some free trafic to its website, it really remains to be seen.